Trampolines are great for developing coordination and fitness of kids whilst having a blast doing it, but what if we said that the trampoline can be used to learn the alphabet as well! All you need is some sidewalk chalk and a little imagination. 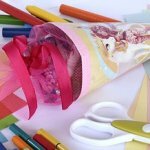 Here’s an idea from Sarah at handsonaswegrow.com. 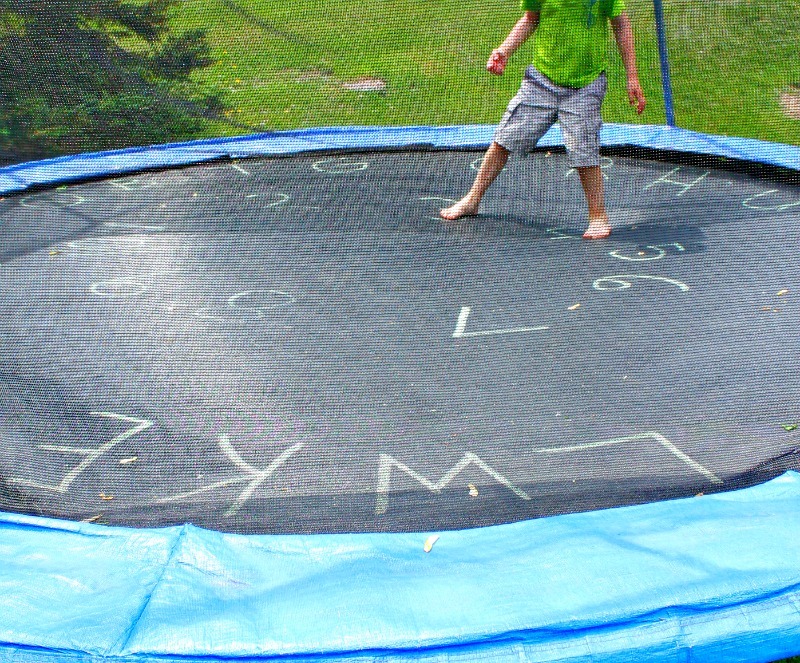 She says to write the alphabet in a random order, around the outer edge of the trampoline. 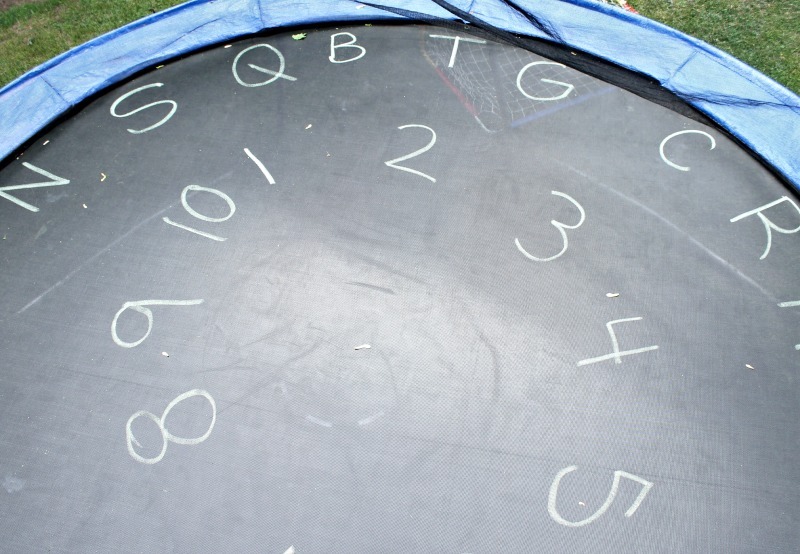 Now, next to that write the numbers one through to ten in a small circle, in the center of the trampoline. There are potentially endless ideas for games to play with this format, but here are a few that Sarah played with her kids. The challenge for your kids, particularly competitive boys, will be to jump from one letter to another on the other side of the trampoline. This is the simplest game, with no right or wrong for which letter to jump to, but just letting your child identify which letter he or she is jumping to next. Start with having your child call out the letter mid flight, then progress to see if they can do the same thing, but instead of saying the actual letter, instead making the letter sounds. You call out a letter followed by a command. So for example, “Jump on S! Now jump on it four times”. Then you can test their memory by giving the next sequence of letters and jumps whilst he or she is still half way through your first command. Get your child to spell out their name. 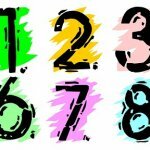 Standard counting, and then counting by twos, then backwards, and so on! 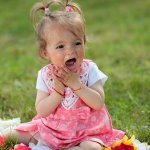 Get your child to spell out words of things of their choice, and you or your other children have to guess the word before they complete it! 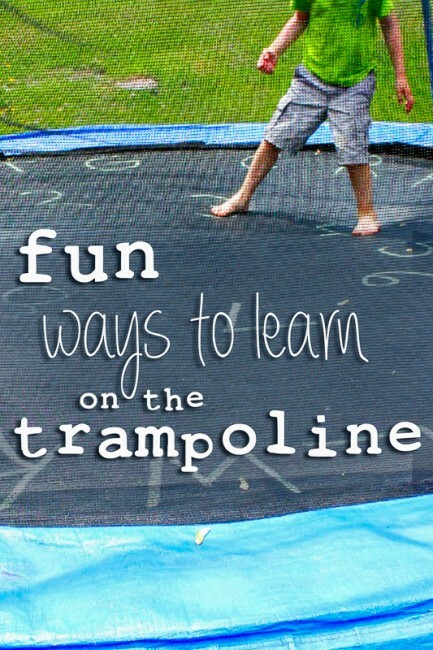 The great thing about trampoline games is they can be suited to whatever level your child is at. You can start with a few letters, or just numbers, and progress from there! Let them explore, let them expand, and let them have a heap of fun (and exercise) doing it! 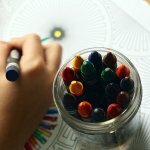 What Is The Purpose of Early Childhood Programs?